Happy April everyone. Spring is in the air, and no one loves that more than our beautiful wildlife. There is no better time of year to really see wildlife at their most active state. Whether it’s because food becomes more abundant or simply the absence of harsh, cold weather, spring activates their senses much like it does ours, and much like us, they take full advantage of it. First the hibernators wake from their winter long slumber. The first animal that comes to mind when we talk about hibernators is the bear. We don’t have bears here on the east end of Long Island; however, I owned a house an hour from the city in Tuxedo, NY (Orange County) and had black bear in my yard quite often.They are extremely beautiful creatures. Bears don’t actually hibernate. What they do is called “torpor”. It’s similar to hibernation where both the heart beat and breathing rate slows down, their temperature drops, but not to the point where the animal falls into a deep sleep and cannot be awakened. In torpor, bears can remain immobile in their dens, without eating, drinking, or going to the bathroom, but they can wake up easily and usually do. The box turtle also has an interesting hibernation system. During the cooler months, box turtles dig themselves a burrow underground, lower their heart rate and completely stop breathing. This doesn’t deprive them of oxygen as they absorb that through their skin. Depending on the temperatures, a box turtle might hibernate between three to five months a year. If you think that’s interesting, let me tell you about the wood frog. This cold blooded amphibian stops its breathing AND its heart beat, together. Their bodies cool down so much that ice crystals form in their blood, and they remain in that state of frozen hibernation under leaf piles or hollow logs, until summer when the warmth stimulates their brain and sends a message to their lungs to start breathing again. Bumblebee queens hibernate, but the males and the workers all die when temperatures hit freezing. The queens hibernate, and when they awaken in spring, they must build a nest and lay a new colony. The garter snake is a reptile that also hibernates. Like most cold blooded animals it is important to stay warm. Therefore, hundreds, sometimes thousands of garter snakes will come together in a large den to hibernate. The large numbers of snakes generate heat in the den space, keeping it sufficiently warm throughout even the most brutal of winters. While some animals are waking up, there are others who are returning home. One of my favorite birds will be making their seasonal comeback to the East End after spending the winter months down south. The amazing fisher-hawk, or osprey will be taking up their nesting positions at one of the many nesting platforms around our area. If it appears that these large nests of thick branches seems to grow taller each year, it’s because they do. The osprey cleans up the nest each return season, from the previous years resident and hatchlings. It removes debris that disrupts the bird’s comfort and strengthens the structure of the nest by adding more branches. When the nest gets too high, it simply collapses or more likely topples over with the help of heavier winter winds. These will be rebuilt from scratch, the following year. Ospreys don’t compete with other hawks for food because their diets are different, but they do have a new and growing contender that seems to have no problem claiming osprey nests as their own. That would be the magnificent bald eagle. They are more commonly known to build their nests in a more secluded, hidden location in tall trees; however, one was recently photographed in Accabonac harbor, East Hampton, mating with another in a vacant osprey nest atop a platform. Two amazing birds of prey that we share the east end with. And while some critters are returning to the beautiful east end, it’s also time for some to leave and return to their native homes north. 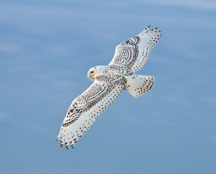 The snowy owl will return to their arctic locales where food will become more abundant with the warmer spring weather, and the juveniles that visit us can return to their homes and not compete with the adults for food. Harbor seals, our visiting marine mammal friends, also return north to their native waters off the coast of Maine and northern Canada during the spring and summer months. Although the grey seal tends to stick around our waters year round, the harbor seals prefer the cooler waters. Birthing season for many animals begins during and just before spring. Those who are born a month or more prior will soon leave their nests and burrows as newly emerging spring babies. The warmer spring air also inhibits recreation and play for wildlife young and old, just like it does for human life. There is nothing more enjoyable to watch than fawns or yearling deer playing, or dancing as I like to refer to it as, in the dreen at the Village Nature Trail. Hopping, twisting, bucking and splashing in the water, full of energy and if even for a short moment, free of fear. This is best observed in the morning hours between late April and mid June, in the rear of the Nature Trail area. Just sit yourself on the first bridge facing away from the duck pond / parking area, and enjoy the show. 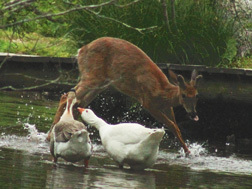 Even if you miss the dancing deer, the ducks never disappoint. 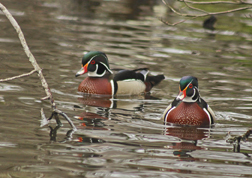 Mallards and black ducks are the majority at the duck pond, but the wood ducks are also present and their colors are extremely vivid at this time. Presently, there are three mating pairs of wood ducks and a lonely gadwall that join in the mix at the Nature Trail’s duck pond section. You might also be fortunate to see “Shadow” a completely melanistic adult mallard (all black). And remember, do not feed the ducks bread. Try chopped greens, seed or duck feed. We have so much to be grateful for, sharing this beautiful land and sea with our wild and marine life neighbors. No where else around our country have I found so many different species of wildlife on such a small parcel of land space surrounded by water on three sides. Not even Yellowstone compares to the variety of wild animals that call the eastern end of Long Island home, not to mention some rare and unique species as well. 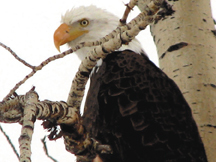 Even better, is the list continues to grow with the come back of the bald eagle and the return of the river otter. It’s truly a paradise that we all share. As we celebrate Earth Day this April, I’d like to remind everyone that it is OUR responsibility to do our part in protecting our environment, which in turn protects our wildlife and OUR quality of life. 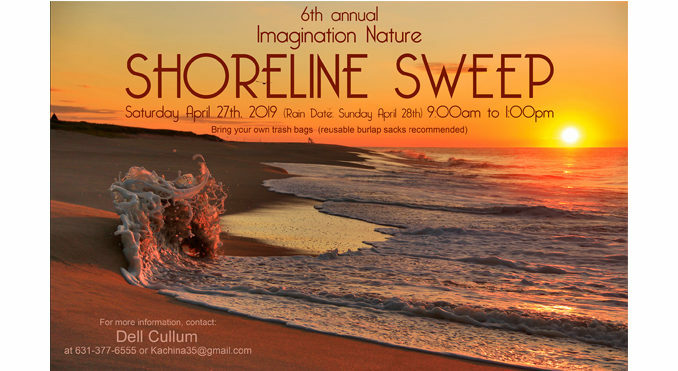 Every year I organize the annual SHORELINE SWEEP (see above), where I call on the community to volunteer just an hour or two of their time, to help in sweeping or removing any and all debris from our beaches. 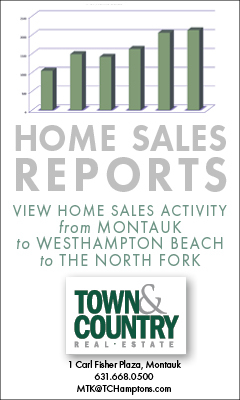 This year I’m asking that you join us at any East Hampton Town beach head from Wainscott to Montauk Point on the south shoreline and Montauk Point to Cedar Point on the north side, and clean a strip of shoreline of all trash and litter. The date is Saturday April 27th (rain date Sunday the 28th) from 9am to 1pm. Thanks everyone, see you at the beach, and remember….